Click on the view slideshow link to view two photos showing Cantor Van Michael being thanked for his years of dedication and service to St. George. 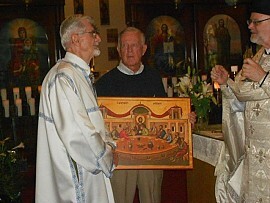 An Icon of the Last Supper was donated to St. George in his honor. Congratulations to Fr. Dennis's on his Retirement!